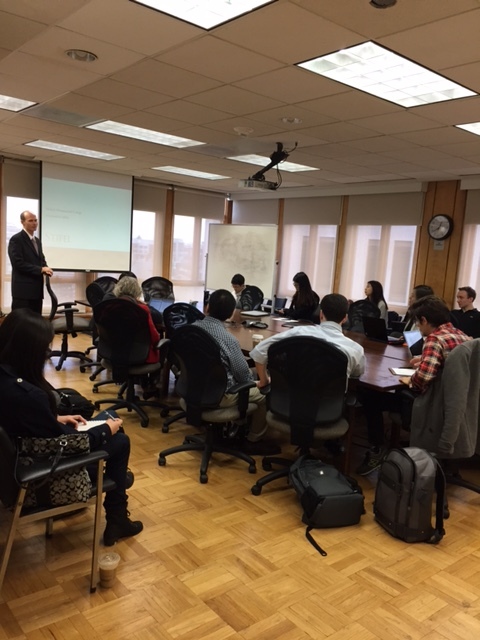 On December 1st, Mike Bailey, a Principal and Healthcare Equity Research Analyst at Stifel Financial’s 1919 Investment Counsel (formerly Legg Mason Investment Counsel), spoke with SAIS students regarding the equity research and investment process, the differences between the buy and sell-sides, and about his experiences working on both ends of asset management. Mike gave those in attendance an “inside view” into the asset management side of the financial industry, as well as some of the elements he considers when recommending stocks to his portfolio managers or clients. Those in attendance asked insightful questions concerning the importance of taking the CFA exam, which courses at SAIS would be best to take and how best SAISers could position themselves to enter into the asset management industry. Mike was very helpful in giving his honest opinion to these and the many other questions he was asked during the event. He also briefly explained the summer internship program at 1919 Investment Counsel and what interns would be expected to complete during their tenure.